The tying tool to quickly and easily twist the looped ends of the sack tie together around the neck of the sack to seal it. Metal wire sack tie sizes in stock - 4" (100mm), 6" (150mm), 7" (175mm), 8" (200mm), 10" (250mm), 12" (300mm), 14" ( 350mm ), 16" ( 400mm ), 18" ( 450mm ), 24" ( 600mm ) Metal Wire Sack Ties. The sack tying tool for the metal wire sack ties is also kept in stock and available to buy online. The thickness of our metal wire sack ties varies from 1.25mm to 1.5mm and the material is mild steel copper coated or Black Annealed. 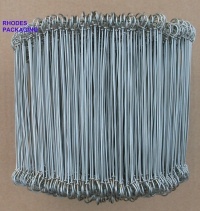 Stainless steel Metal wire sack tie sizes in stock - 6" (150mm) & 8" (200mm) length. Our Stainless steel sack ties are 1.25mm thickness ( 17 gauge ). The sack tying tool for the metal wire sack ties is also kept in stock and available to buy online. Plastic covered wireTwist ties are used within the retail market for securing products in place. i.e cables and bags. Twist ties are re-usable fasteners. Black Plastic Cable Ties (White Plastic Ties available), 125mm (5"), 200mm (8"), 300mm (12"), 370mm ( 15" ) & 530mm ( 21" ) in stock. All of Our plastic cable ties are available for next day delivery. FREE SAMPLES AVAILABLE OF ANY SIZES ! Plastic Coated Metal wire sack tie sizes in stock - 6" (150mm), 8" (200mm) Metal Wire Sack Ties. The sack tying tool for the metal wire sack ties is also kept in stock and available to buy online.